Coin of Artaxias I (ca. 190-ca. 160 B.C..) with a dog on the obverse. It is not a secret that the Armenian Highlands have played a vital role in the spread of agriculture and domestication of animals. Among the many animals that have accompanied the early inhabitants of the Armenian Highlands, the dog in particular has a special place in Armenian history and culture. As the inhabitants of the highlands started to domesticate livestock, shepherd dogs have become a vital part of their household. 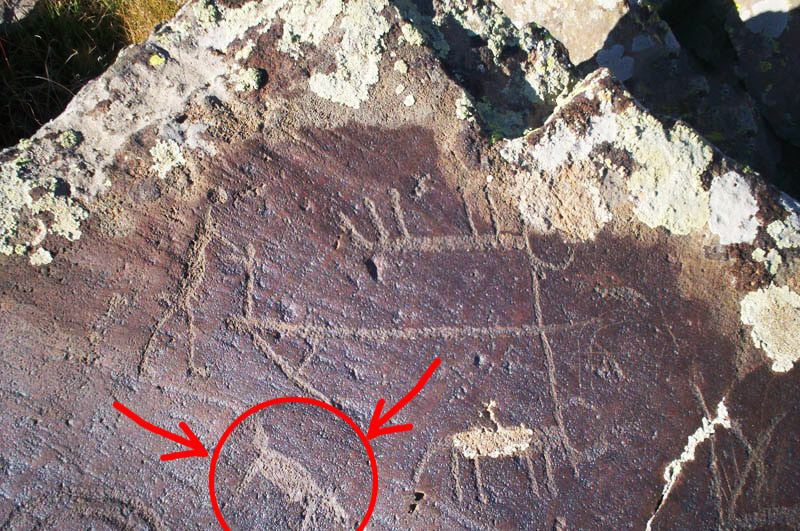 Petroglyphs found in abundance in the territory of today’s Republic of Armenia, mostly in Geghama and Syuniq mountains, are a rich source of information on the emergence and the development of the Armenian dog. Dating back from the 12th to the 3rd millennia B.C., these rock carvings contain an amazing record of different dog images; they are also remarkable for the diversity of roles these dogs perform. Shepherd dog alongside cattle plowing the earth depicted on 7000 year old petroglyphs found in Armenian mountains. That the animals were not used as a dietary source but rather as companions is attested by countless archaeological discoveries of complete dog skulls. Numerous dog skeletal remains have been found dating from the Neolithic to the Middle Ages. Neolithic sites containing dog remains are Shengavit, Mokhrablur and Metsamor. Bronze Age and Iron Age sites are Tsamakaberd, Sevan, Lehashen, Arteek, Ketee, Gilli and Shirakavan. Middle Age sites with dog remains include Artashat and Beniamin. 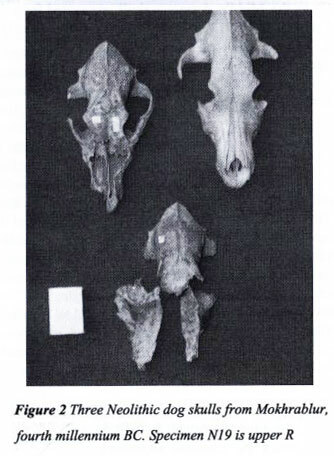 Twelve archaeological sites contained intact dog skulls. Dog skulls dated at approximately 6000 BP have shown remarkable preservation so that osteometric analysis has been possible. During a joint venture project between the University of Innsbruck, Austria and the Yerevan State University, archaeologists found an incredible amount of animal bones at the prehistoric Armenian village of Aramus. The findings were published in 2004 titled: Animal Bones from Aramus, Armenia, Excavation 2004. Among many other animals they found remains of several dogs at the site. Including a 3000 year old dog mandible with preserved teeth. Judging by the mandible the dog was bigger than a Foxterrier (withers height 39 cm), but slightly smaller than a German Shepherd. The overal sizes of the excavated dog remains from Armenia are quite large and Miklosi (2015) in his work Dog Behaviour, Evolution, and Cognition describes them as: “approaching the size of the wolf”. Much of historic Armenia is today part of eastern Turkey. There too discoveries of dog remains are found regularly. In 2015 for example a fully preserved skeleton of a 3000 year old dog was found in the city of Van (the center of ancient Armenian civilization). An interesting aspect of the Armenian archaeological finds is the large numbers of bronze age zoomorphic statuettes, pendants and pictographs depicting dogs. 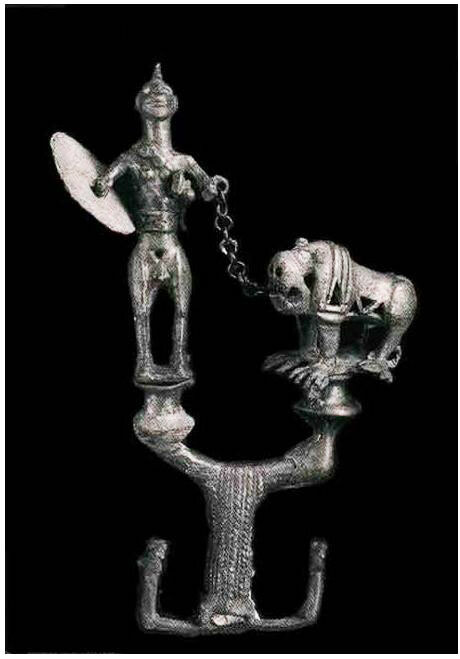 One unique piece was a bronze statuette of a dog with a collar and leash. All of this is evidence for a very old dog culture on the Armenian plateau where dogs have been a vital companion and assistant of the local inhabitants in many different ways. Armenian landscape primarily consists of highlands with hot, dry summers and cold, snowy winters. Sheep, goat and cattle herding has always been an essential part of Armenian life. For this purpose Armenians have anciently kept guarding dogs with their livestock. Evidence for shepherd dogs on Armenian Highlands goes back for millenia. One such famous livestock guardian dog is called the Gampr, meaning “large hairy beast” or, at times, Gelkheght, meaning “wolf choker”. Gampr is a powerful and reliable livestock guardian who has been bred about 3000 years ago. During the Soviet Union in Russia, Gamprs were also utilized to develop the modern Caucasian Ovcharka. Another important task of these early Armenian dogs was assisting their owners during hunting. Countless rock art engravings attest to such practices dating back to the neolithic period. 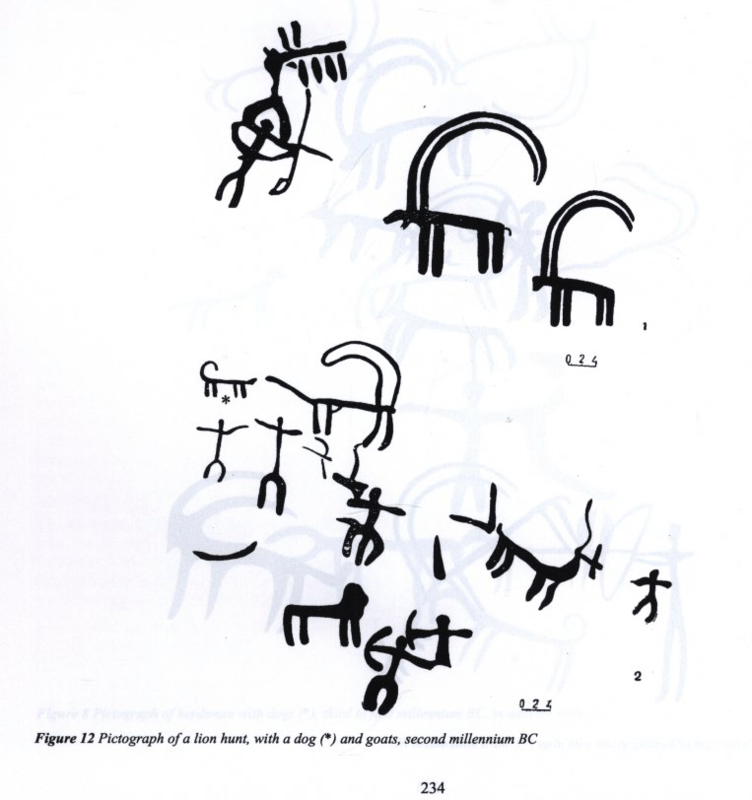 Several known examples of rock engravings include scenes of hunting with dogs which are found in Armenia from the 3rd or 2nd millennium BC (Schnitzler 2011). Hunting dogs with pricked ears and curled tails are also seen on leashes hunting wild goats, lions and leopards in 4th millennia BC rock art from Armenia (Manaserian and Antonian 2000). Dogs have also known to assist hunters with hunting bears. A bear-hunting dog in Armenia is known as ‘archashoon’ (“bear-dog”). Warrior with his war dog. Excavated at Artik region of Armenia, this bronze figurine dates back to the 13th Century BC on display at the National History Museum. Dogs have also seen their fair share of warfare. Statuettes from the early bronze age have been found in Armenia displaying war dogs. War dogs were also used during warfare by the Artaxiad dynasty generals and kings of Armenia. Some of them even displayed dogs on their coins as seen in the image at the beginning of the article. The bronze coin shows the bust of king Artaxias I (190-160 BC) and on the reverse a guard or a war dog. The tall, short-coated Gampr dogs are also believed to have been a favorite of the 1st century Armenian king Tigran the Great, who ruled an empire between 95 and 66 BCE. According to several Roman military authors such as Polyaenus (Rautman M.L, 2006), the war dogs from Asia Minor were in particularly renown. The Roman Caesar took fighting mastiffs on his campaign in northern Europe along with legendary war dogs of Asia Minor. Ancient Armenians believed that when a brave man fell in battle or by the hand of a treacherous foe, divine spirits called “Aralez” or “Arlez” descended to restore him to life by licking his wounds. Their name means “lappers of brave men,” or ” lappers of Ara”. The Aralez were invisible spirits who were imagined to exist in animal form as dogs (Amanikian, 1916). The legend of Ara the Beautiful recalls the quin Semiramis who has claimed to have resurrected Ara from his death on the battlefield after his wounds were licked by Gods. Faustus of Byzantium was an Armenian historian of the 5th Century A.D., and most of what we know about the early history of Christianity in Armenia is attributed to his six volume Buzandaran Patmutiwn (literally, “Epic Histories”, but referred to as the “History of the Armenians”). There Faustus discusses how after the death of general Mushegh his family had also tried to resurrect him. Faustus discusseshow the young Armenian king Varazdat listened to bad advice from his nobles and killed his own loyal general Mushegh, and as Mushegh had survived a whole lot of bloody battles without serious injury, his family found it hard to believe he was dead. They believed that he would have been brought back to life by the Aralez. When they had taken the body of sparapet Mushegh to his tun, to his family, his family did not believe his death, despite the fact that they could see his head separated from his body. They said: “He has been in countless battles and never received a wound. No arrow has ever struck him, nor has anyone’s weapon pierced him.” Half of them expected him to resurrect, so they sewed the head back onto the torso and placed it on the roof of a tower, saying: “Because he was a brave man, the arhlezk’ will descend and cause him to arise.” They guarded [Mushegh] expecting his resurrection, until his body putrefied. Then they brought him down from the tower, and wept over and buried him, as was the proper way. – Faustus of Byzantium, History of the Armenians, Book 5, Chapter 36). Another famous account of a divine dog comes from the work of the 5th century historian Movses of Khorene. In his work History of the Armenians Khorenatsi mentions that a miraculous white animal that rescued the Armenian princes Sanatruk from a snowstorm was a dog, and presumably an Aralez. Eznik of Kolb (born 374 A.D.), was an Armenian Christian theologian and priest, author of a number of significant philosophical treatises on good, evil and free will. He too mentions these divine dogs by name in his “Refutation of Sects” (Ełc ałandoc’). It is clear that the dog has been a part of Armenian culture since pre-history and has been a vital part of Armenian household ever since. From sheep herding, guarding, hunting and even in war the dog has been a true friend and assistant in the survival of the Armenian nation. Armenian myths and folklore such as the fairy tale of Zangi-Zrangi praise and deify the unrivaled courage, strength, beauty, wisdom, candor, loyalty and noble character of the Armenian dogs. Therefore dogs enjoy a well-deserved and important role in the history and culture of Armenians. Manaserian NH, Antonian L (2000) Dogs of Armenia. In: Crockford SJ, (editor.) Dogs Through Time: An Archaeological Perspective. Victoria, B.C., Canada: BAR International Series 889:227-234. Koghbatsi, Yeznik (Eznik of Kolb). Ełc ałandoc’ (Also known as, De Deo, Against the Sects, or Refutation of the Sects). 5th Century. English translation by Thomas Samuelian, Diocese of the Armenian Church. St. Vartan Press, 1986. P’awstos Buzandac’i’s History of the Armenians. 5th Century. English translation by Robert Bedrosian. Schnitzler, A. E., 2011. Past and present distribution of the North African–Asian lion subgroup: a review. Mammal Review 41(3), 220-243. Other links are included in the article! Has anyone seen the original folk tale about the black dog of fate? I know it is the title of Peter Balakian’s book but I am looking for a written version of the original story. Please credit the last photo of the article to Hamlik Parsanian. He took the photo along the road to Amberd fortress. The single dog in the first photo- might not be gampr, please find the origin of the photo. Many photos are inappropriately copied and claimed as gampr by certain Facebook pages, that are actually not gampr. Hi I am a zooarchaeozoologist from the Institute of Zoology of NAS Armenia. I would like to know who is the author of this article and which archaeologists from Yerevan State University collaborate with Austrian colleagues??? ?